Ask anyone what they love about Christmas and you can take a bet one of the most popular answers will be Christmas baking. Cookies are delicious all year round but add a little festive fun and they're even better. Christmas cookies have been a holiday tradition for years across continental Europe - less so in the UK. Children in the United States have been leaving Christmas cookies and milk out for Santa Claus on Christmas Eve since the 1930s. Why Do We Have Christmas Cookies? The origins of Christmas cookies go back even further than that. Cookies have long been a part of Christmas tradition. This was originally because of the price of the ingredients needed to make them. Sugar was expensive and therefore a rare treat. Holidays such as Christmas and Easter where the only times people would buy the extravagant ingredients and therefore became synonymous with cakes and cookies and sweets. Nowadays the ingredients needed to make Christmas cookies are much more accessible. Because of their popularity, Christmas biscuits are available at almost every supermarket on the run up to Christmas. You can buy every kind in every flavour but where is the fun in that? Sure, you may be guaranteed the taste but one of the best things about Christmas cookies is making them! A Whole World of Flavours! There are literally hundreds of Christmas cookie recipes. Different countries have different traditional recipes. 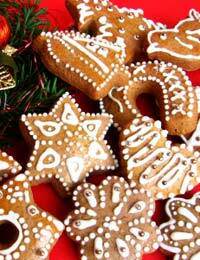 German Christmas cookies for example use less sugar and more spices such as cinnamon and nutmeg. The most popular variety are plain sugar cookies, which are cut into various festive shapes including Christmas trees, holly leaves, presents and snowmen. The cookies are often used to decorate the Christmas tree, although it is unlikely the delicious biscuits will stay on the tree for long! Here is a quick and simple recipe for Christmas Cookies. Put the icing sugar, vanilla essence, egg yolk and butter into a mixing bowl, then mix with a wooden spoon (or use a food processor). Add the flour and mix to a firm dough. Shape dough into two rounds balls, slightly flattened and wrap each on in clingfilm. Chill for 20-30 mins. Heat oven to 170ºC/gas 5 (or 190ºC if you have a fan oven) then grease and line two baking sheets with non-stick baking paper. Take the dough out of the fridge and roll out on a lightly floured surface - the dough should be a thickness of around 1 cm. Cut out shapes - you can buy christmas shaped cutters or try your own with a sharp knife; bells, snowmen, stars and angels are quite easy. Then place on the baking sheets. Use a skewer or point of a sharp knife to make a small hole in the top of each cookie (this will be for hanging ribbon once cooked). Bake for 10-12 mins until lightly golden. When slightly cooled place the biscuits onto a wire rack until cold. Meanwhile, mix the icing sugar with a few drops of cold water to make a thick, but slightly runny icing. Colour with edible food colouring, if you like. Spread it over the cooled biscuits, decorate with sparkly edible decorations. Once the icing is dry, thread with a shiny ribbon or gold thread. TIP: Cooking with your children is one of the most enjoyable parts of Christmas. Even the youngest children can join in the fun. Have them help mix the cookie mixture or let them choose which cookie cutters to use to make their favourite Christmas shapes. If you've loved making these, why not try making Christmas gingerbread men or some homemade fudge for a relative this Christmas?